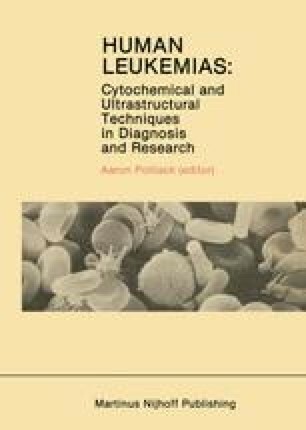 Acute nonlymphocytic leukemia occurring in individuals having received alkylating agent chemotherapy and/or radiotherapy is a well-recognized complication of treatment of hematologic and nonhematologic malignancies and certain nonneoplastic disorders [1–9]. The incidence of acute leukemia in these patients is not well established but appears to be related to the intensity of therapy and age of the patient [10–12]. The interval from the commencement of the treatment of the primary disease to the recognition of the secondary leukemia varies considerably; in the patients studied in this institution it has ranged from 25 to 182 months, with a median interval of 66 months. Response to treatment for the therapy-related leukemias has generally been poor and survival has been shorter than for non-therapy-related acute myelogenous leukemia [13–15].